Each month I will describe sights of interest in the night skies of South Carolina. These sights will be broken down into three sections; what you can see with the naked eye, with binoculars, and with a small telescope. The best time to view the night sky is at and around the times when the Moon is not visible, what is known as a New Moon; which will occur this month on February 21st. For February, your best viewing nights will be from February 14th to the 27th. The Star chart below is set for Florence, SC on February 15th at 9 pm. There are two interesting naked eye events this month. Naked eye events are great ways to introduce your family or friends to astronomy. You only have to step outside and look up in the sky; there is no need to set up telescopes or bring out binoculars. One event will occur on the 22nd starting in the west right after sunset. Check between 6:30 and 6:45 pm. You should be able to see a thin crescent Moon. To the left of the Moon, the star-like object is the planet Mercury. Explain to your family or friends that it is usually difficult to see Mercury because it is so close to the Sun. There are seven planets in our solar system besides the Earth, of these; only five are visible to the naked eye. Anyone who has an interest in astronomy can spot the four easily viewed planets, Venus, Mars, Jupiter and Saturn. Mercury is only easy to see if someone directs you to it or, as on the 22nd, you have a celestial marker. For planet viewing, this month is somewhat rare because you can see all five visible planets in one night over a period of only five hours; the description is as follows. 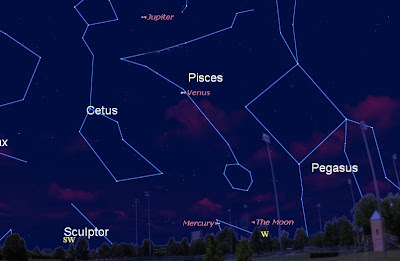 Once you find Mercury next to the crescent Moon, look above and you will see the bright planet Venus. 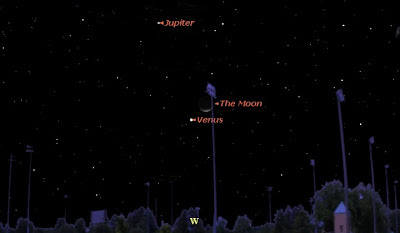 Above Venus you will see the planet Jupiter, see image below. Next, come back out at 9 pm. You will notice that Venus is about to set in the west, and Jupiter is still visible. 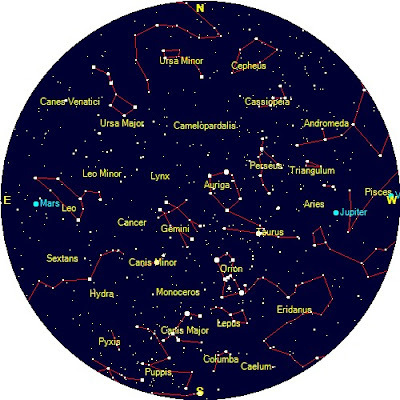 Now turn to the east, and you will see that Mars is well above the horizon; see image below. Finally, if you come back out at midnight, you will see the planet Saturn in the east below Mars; see image below. If you miss this event on the 22nd, don’t worry; you can continue to see all five visible planets for several weeks. The limiting planet is Mercury, and of course Mercury is easiest to see when it is farthest away from the Sun; this will occur on March 8th. On March 8th, you can see all five visible planets over a period of only three hours. The reason I targeted February 22nd is that this is the only time that you can use the crescent Moon to help you locate Mercury. Once you realize what Mercury looks like, it will be easy for you to keep track of it over the next few weeks. As I mentioned, this planet alignment is somewhat rare. 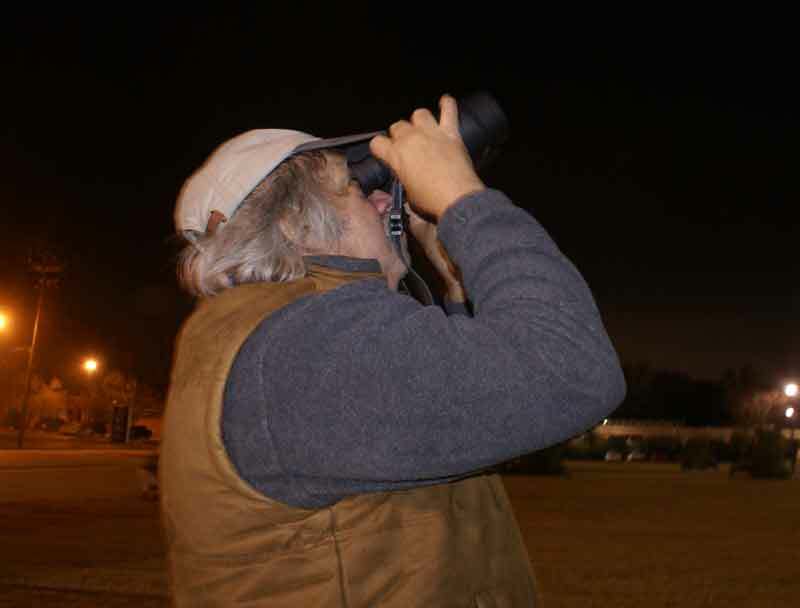 Even rarer is to be able to see all five visible planets at the same time. This has happened in June 1946, April 2002 and next in September 2040; so mark your calendars. The second naked eye event this month is not as special; however it is a nice visual. 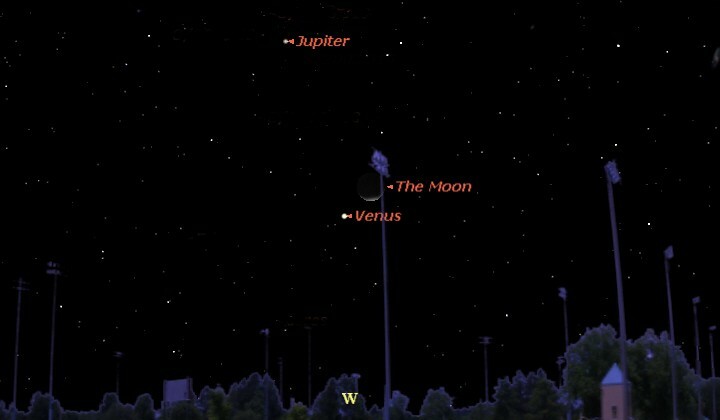 On the 25th of this month between 7 and 8 pm look to the west to see a beautiful view of Venus next to the crescent Moon. Using a simple digital camera, you should be able to capture this event. As mentioned above, you can view the five naked eye planets near the end of the month. In addition, you will have a chance to also add the planet Uranus to your viewing list. 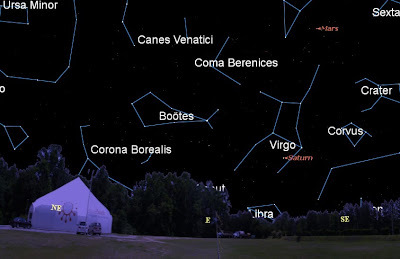 Now as an amateur astronomer you can check and find that Uranus is visible this month, and then using star charts and or astronomy computer programs, you can attempt to locate Uranus first with binoculars, and then with your telescope. Locating either of the last two outer planets can be made simple if the planet passes near an easy to locate object. 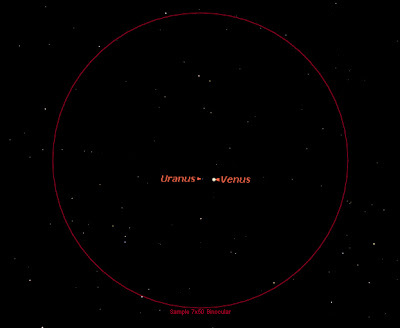 This month on the 9th between 7 and 8 pm, Uranus will be just to the left of the bright Venus in the western sky. You will easily spot it with simple binoculars. The image below shows your view through the field of 7 X 50 mm binoculars. Whenever either Uranus or Neptune passes close to a visible planet or a bright star, I mention it in my column. The last time this event occurred for Uranus was in June 2010 when Uranus passed close to Jupiter. The only difference in this event was that it occurred between 3 and 4 am in the morning. Many amateurs are not willing to get up at that hour to see an outer planet. However, as you can see above, not only does the Uranus/Venus event occur in the evening, but it won’t even interfere with your bedtime. So what can you expect to see? 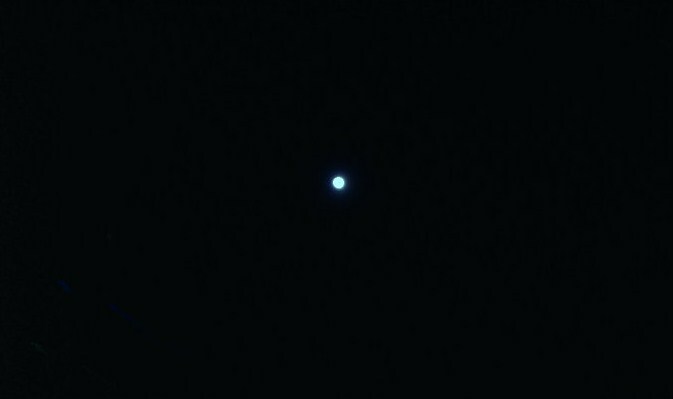 Even with my 25 X 100 mm binoculars, I can see that Uranus is a blue planet. With a telescope, you should easily be able to see Uranus as a blue disk; similar to the image shown below. Naked Eye Sights: See discussion above. Telescope Sights (60-100mm: During the last week of the month, you can observe the five naked eye planets with your telescope. 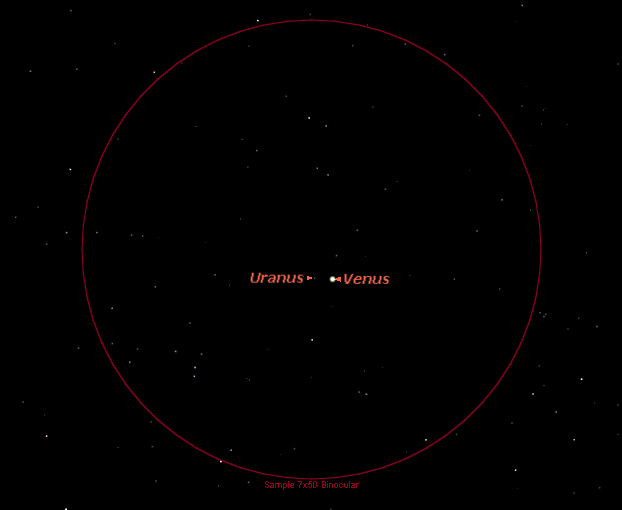 On February 9th, take the time to observe the planet Uranus as it appears close to Venus. Hopefully you will be able to see the blue color of the planet.